The Summer Camp will take place from 5th to 15th July with the arrivals and departures on the first and last days respectively. The base will be in Göd, a small city close to Budapest on the north, at the Danube river. All the programs’ costs, transportation, accommodation, and food will be provided by the organisers. The participants should cover the travelling cost to Budapest and they should pay € 330 as participation fee. We also recommend to bring some pocket money (around € 100 is suggested). Participants will meet the organisers Rotary Club Göd members at the Budapest Airport (Liszt Ferenc) on 5th of July according to the participants arrival time, and they will travel together to Göd (40-50 minutes drive). At the end of the Camp the Rotary Club members will take care to get the participants to the airport in time. The applicants should send their attached AF with the needed recommendation and signatures of the sponsoring Rotary Club in e-mail to Rotary Club Göd in PDF or WORD format rotary.club.god (at) gmail.com. 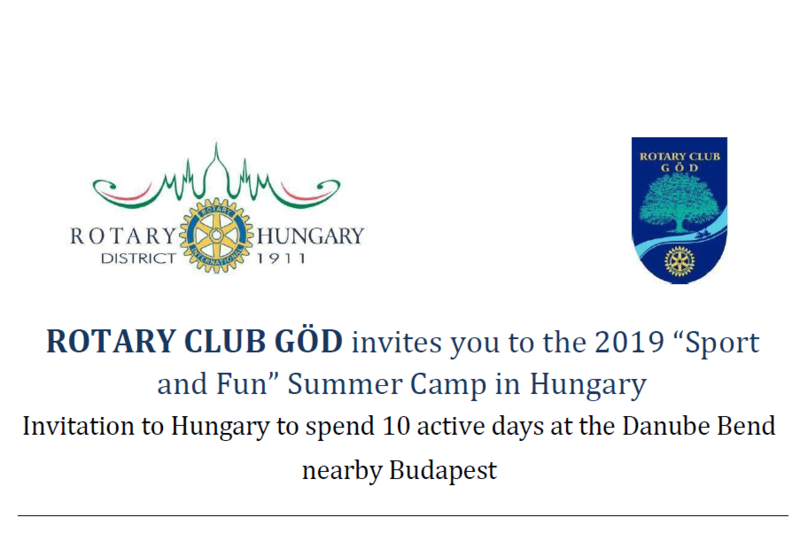 Please put all of the e-mails in CC to D1911 CAMP Coordinator camp.anettolle (at) gmail.com who is supporting the RC Göd Summer Camp and Gabor Erdi-Krausz robag0705 (at) gmail.com, mobile: +36 30 930 4470 from Rotary Club Göd. Download a detailed program here.